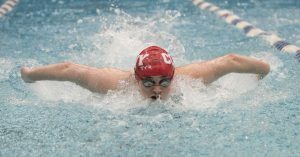 Cony's Gabby Low competes in the 100-yard butterfly during the Class A swim championships in Orono on Monday. Orono, Maine—02-19-2018 —Cony’s Gabby Low competes in the 100 yard butterfly during the girls Class A swim championship in Orono on Monday. Low won with a time of 55.38.